Daily news is the main source of information that can indicate where the IT industry will be heading to in the nearest future. But in the past several years experts' predictions often hit far from the mark. And it's not economic factors or situation in the world that caused those misses. The thing is that microelectonics is evolving like a house on fire, and noboby can prognose whether a certain development will be useful or useless even a year later. In this article, we won't be digging for details of future platform components  we do a lot of such stuff in daily news; nor will we be wasting our time trying to predict what will be closer to the autumn  that's a task for specific author's articles. What I suggest we do within this material is spare a few minutes on studying seemingly scattered examples of different computers: desktop, portable, pocket, car. We'll try to seize the spirit of the time, some actual trends in the way manufacturers are trying to adjust to customers that have become more choosy nowadays. In this respect, the source of information is not at all so important, it is all about how innovative and rational the new ideas are. For example, let's take a conceptual Intel platform that the company offers as the base for their home media computer. The PC case design is suggestive of a steady trend, namely, that home PCs are now increasingly often associated with home electronics. It doesn't matter what is inside  a special multi-purpose SoC chip, an integrated VIA Eden platform or a Pentium 4 CPU with a Grantsdale chipset. The only thing that matters is that the computer shouldn't break down and should provide a quick and quality access to home leisure and entertainment. Such PC are, indeed, better to look at through the eyes of an ordinary customer. 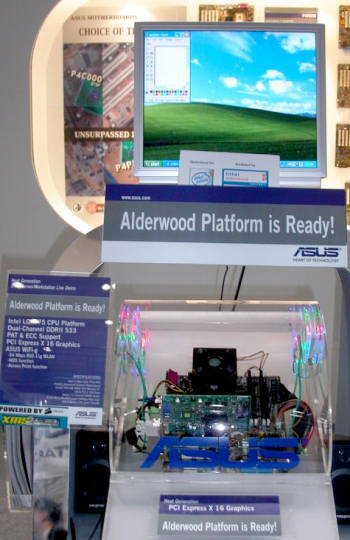 What difference does it make to him if the computer is equipped with a superior Serial ATA HDD, a TV tuner with a PCI Express bus, an double HF AverMedia module, and a CPU that supports HyperThreading? A model sells well if it is "cooler" than its analogs, more functional than rivals, and not only limited to the conventional functions of a home cinema, a wireless file server, a DVD player, and a PC for web surfing. It's not megahertzes or cool technologies that make a good turnover in the field of home digitals. Customers have been long tempted into buying devices by other means. 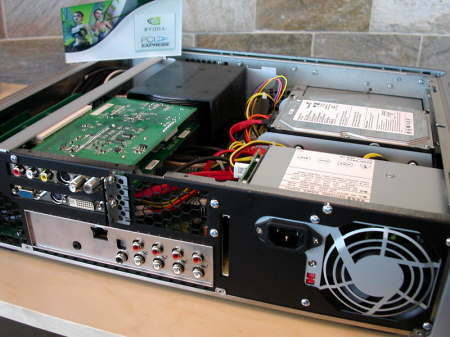 The HUSH AVX Music Server presented at CeBIT 2004 is even farther from a conventional PC look, although it is based on a VIA EPIA M10000 Mini-ITX platform. This device is a result of cooperation of VIA Technologies, Digital Fidelity, and HUSH Technologies. 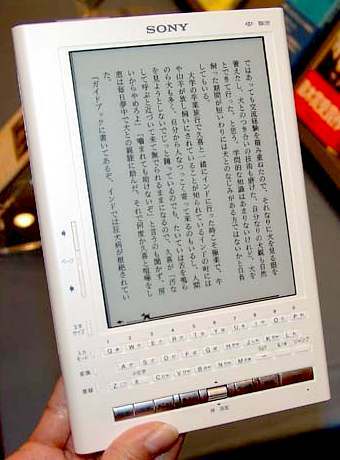 It can store writes with a total size equal to 1600 CDs, and play them via a unique PDA interface with Wi-Fi connection. By the way, playstation manufactures aren't sleeping either. It is, in fact, their sector that developers of specialised computers are aiming at. But while a home system based on an avdanced PC implies a certain narrowing of the computer's base capabilities, playstations will only become universal in the next generation at best. 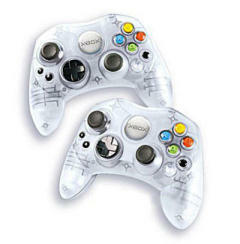 That is why playstation suppliers can seldom surprise customers with anything except all sorts of peripherals. 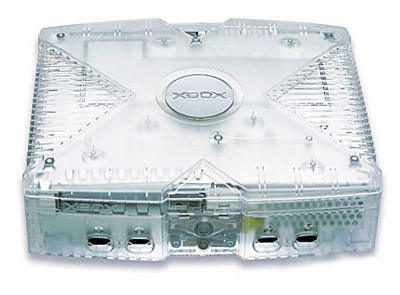 Or with an unusual appearance, as was the case with Microsoft that recently produced a limited edition of a semi-transparent Xbox playstation (Special Edition Xbox Crystal Pack). 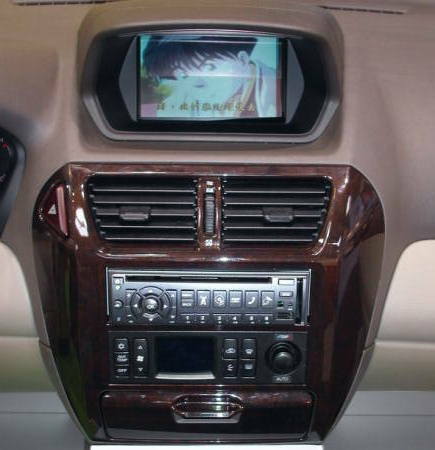 Car PCs refer to another interesting but virtually unexplored market sector. 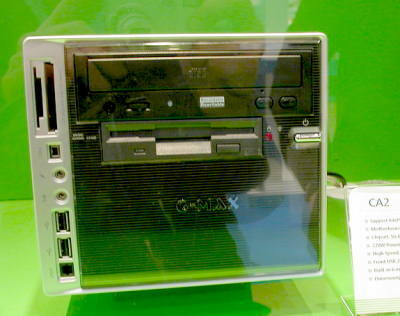 Some of the examples were exhibited at CeBIT 2004. Of course, such specific conditions imply specific requirements for packaging, arrangement of control parts, economic efficiency, and compactness. 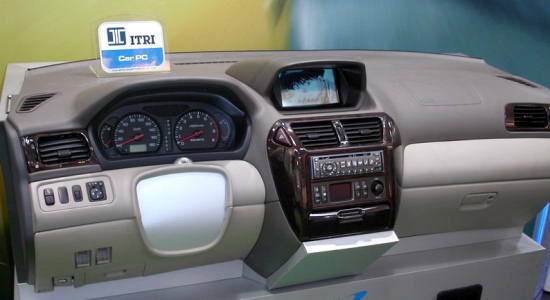 But then again, the result is repaid a hundredfold: you get a computer, a TV/FM tuner, and a compact audio/video system all in one. 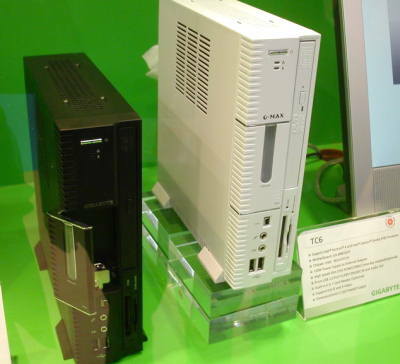 There are also those compact desktop mini-systems that are supplied with barebones, and CeBIT was rife with such exhibits. Below are two Gigabyte products of that kind: they are compact, powerful and wholly-functional  again, all in one. Such minute wholly-functional PCs with a full set of interfaces are still very popular. And it is no surprise, as a PC can be transformed into an audio/video or game terminal in a matter of minutes, though is it much more difficult to make a reverse transformation of a specialised game console. 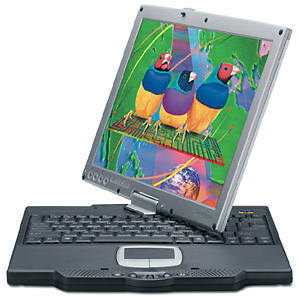 Mobile PCs have suffered even more impressive changes in the design. On one hand, there is the Elitegroup company that was a desknote trailblazer two years ago. Now they are planning to give up the idea and to start producing inexpensive base-level notebooks, although they intend to say goodbye by making a 15" notebook based on a P4 Prescott CPU for desktop PCs. On the other hand, there are the so-called LAN-party lovers who don't want to move their PSUs to and fro and who are just craving for powerful and compact PCs to appear. Well, this demand will be supplied too: the Dell company has recently presented its Inspiron XPS notebooks "aimed at serious and enthusiastic players". 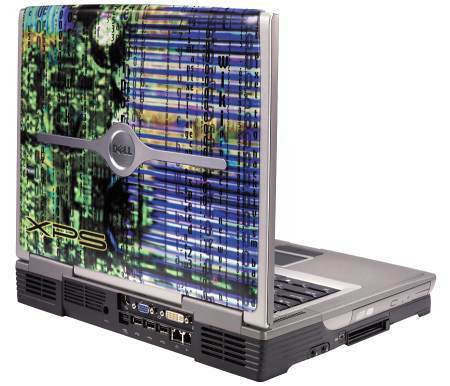 Inspiron XPS has a 15.4" UXGA UltraSharp widescreen display, is based on 3.4 GHz of Pentium 4 or Pentium 4 Extreme Edition CPU of the ATI MOBILITY RADEON 9700 graphic subsystem, has a 128-MB DDR memory and enables future upgrades. The model's design was adjusted to the tastes of the target audience, and the notebook package also contains one of the colour removable covers from the QuickSnap Color Kit. However, it's getting increasingly difficult to invent a really new portable PC. Until there appear a new elemental base or good design innovations, manufacturers have to exploit the existing developments trying to realise them better than their rivals. If we, for example, take the idea to create a barebone notebook, it is itself not at all new, but its realisation in Chaintech's IMO-Desk PC looks quite fresh and original. Until the end of April, the company is planning to present eight IMO-Desk models made with different monitor diagonals and for different Intel's and AMD's CPU platforms. Each model has an optical cord, a remote controller, an integrated 6-format cardreader, and allows for significant packaging changes. Unfortunately, there have been no major design changes in tablet PCs lately. Of course, Centrino-based variants have acquired a two-range wireless 802.11b/g adapter (like the new ViewSonic V1250S), new and more economy-efficient CPU have appeared. But perhaps it's high prices for tablets, or maybe low sales volumes, or some other factors that don't let developers of tablet PCs have good business. I even wonder sometimes if tablets appeared way too early and customers are just not mature enough for them. 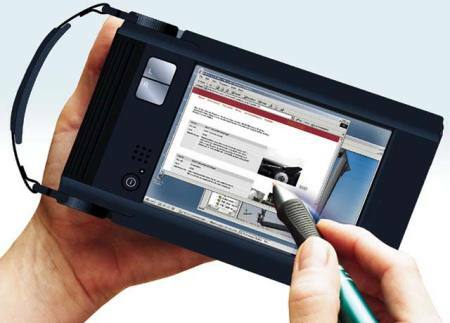 People are always interested in new devices that refer to somewhere between notebooks and PDAs (remember Toshiba's minute Librettos or ASUS's S200N). Lately this sector has been enlarged by a new NEC device that can't be given a clear-cut identification. 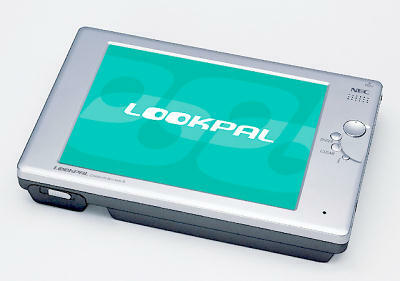 LOOKPAL is based on a PDA Intel PXA255 CPU with a 400-MHz clock frequency; it has a 32-MB RAM and a 64-MB ROM, equipped with a 640 x 480 x 65K LCD, so it looks like a PDA, doesn't it? On the other hand, it can also be classified as a single-drive top-light tablet notebook due to the rest of its parameters: a 8.4" display, an integrated CD-ROM, a LAN interface, and a 1.1-kg weight. The company itself positions LOOKPAL (driven by one of Linux clones) as a personal CD-ROM equipped terminal for Internet surfing, image viewing and music playback. 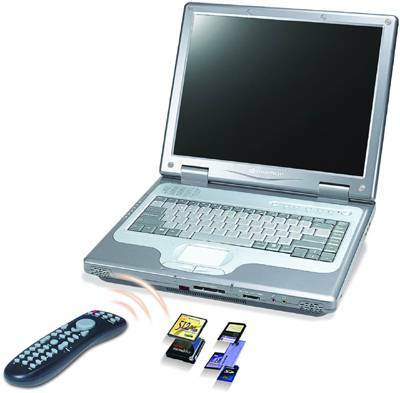 Sony LIBRIe is another new interesting device that can be placed between PDAs and Tablet PCs. However, it has a clear positioning and probably a rosy future. It is the first much-anticipated e-book based on "electronic paper" and made for serial production. During several past years we've been watching the development of "electronic paper" technologies in hi-res monochrome displays basing on which cheap and convenient "e-newspapers" were planned to be issued. The EBPR-1000EP e-book under the Sony LIBRIe trademark was made in close cooperation with Royal Philips Electronics and E Ink Corporation. This first e-book is based on a Philips SXGA (800 x 600) display with four grey grades (for a better font smoothing) and a five-step brightness regulator (E Ink's technology is used). The image on such display looks like a monochrome-printed one with the resolution of about 170 ppi. Because the display only consumes energy when images are changing, the developers assure that four AAA alkaline cells will suffice to view about 10,000 pages. Providing a 512-MB Memory Stick PRO card is installed, LIBRIe EBPR-1000EP stores up to 500 average-size books that can be downloaded from the Internet and other sources. 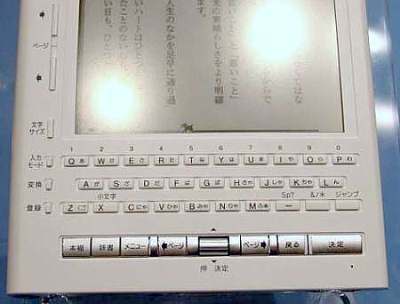 The book is also suplied with a keyboard, a 10-MB memory, a traditional Memory Stick PRO slot, a built-in microphone, a dynamic speaker, a Head-Out (for the integrated microphone function), and a USB interface. By the way, there is a whole class of viable Windows XP notebooks that are no larger than some PDAs. A short time ago, IBM Japan began shipping minute compact IBM PC Core Systems that weigh as little as 300 g.
However, it will hardly happen soon, as current PDAs are constantly renewed by models based on more advanced CPUs with the Microsoft Windows Mobile 2003 OS. 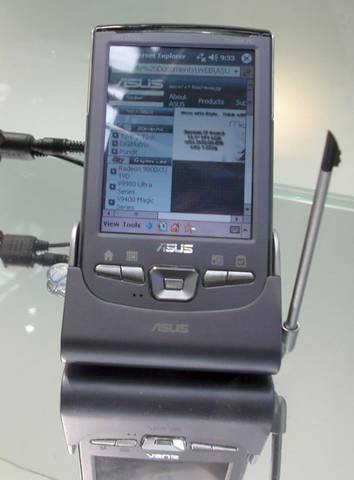 CEBIT 2003 saw the presentation of one of such new PDAs, ASUS MyPal A716. This new device is equipped with a 400-MHz PXA 255 CPU, a 3.5" 240 x 320 LCD, an integrated 802.11b/Bluetooth adapter, and also Secure Digital and CompactFlash extension slots. Besides, A716 has the Smart Power Saving technology, that, according to the company officials, enables to increase the run-down time to 19 hours (with an additional accumulator). And in order to make the device emphatic against other silver-grey PDAs, a bit of lilac was added to its colour. However, due to their extended functions, PDAs now increasingly often compete with smartphones in terms of functionality. Thus, it is difficult sometimes to draw the line and classify a device. PDA's OS capabilities become more and more versatile, which probably means that these two classes will merge, or at least, all major differences between them will disappear. Well, these are modern computers, versatile and multifaceted. But coming back to the topic touched upon in the beginning, it can be clearly seen that a digital home is unique and personal for each particular customer. For example, my neighbour may want his Digital Home to include a media system with a 40" liquid crystal TV-screen, an e-book for reading in metro, and a GPS receiver on his dog's collar, that would send the information to the home terminal. As for me personally, I may content myself with nothing but a tiny pocket notebook with a Wi-Fi slot for Internet access, a CF slot for downloading digital photos from my camera, a monstrous (though very quiet) base desknote with a 17" display, that would serve as a printing machine and a DVD/MP3 player. Someone else may still rack his brains trying to find some liquid oxygen for reaching a record clock frequency of his CPU. Another person will correct his interlocutor and say that he's got an "automobile" office, not a mobile one. In other words, the course for PC personalisation taken several years ago has gained a fantastic speed. It seems like there's not much time left before bleak grey desktop boxes say goodbye for ever. But interestingly, it is pleasant to be aware that the most advanced computers are not neceassrily those showing the highest performance. Although "computer consumption culture" is an issue for a separate discussion.